We present a new statistical fault analysis technique called fault intensity map analysis (FIMA) that evaluates the responses of cryptographic implementations to biased-fault injections with varying intensities. FIMA exploits information from fault bias, as well as the correlation between fault distribution and intensity, to retrieve the secret key with fewer fault injections than existing techniques. FIMA generalizes several existing statistical fault analysis techniques, such as fault sensitivity analysis (FSA), differential fault intensity analysis (DFIA), ciphertext-only fault analysis (CFA), and statistical ineffective fault analysis (SIFA). FIMA has the flexibility of using different observables, e.g., faulty ciphertexts, correct ciphertexts under ineffective fault inductions, and data-dependent intensity profiles, and is successful against a wide range of countermeasures. In this paper, we use FIMA to retrieve the entire 128-bit secret key of the Ascon authenticated cipher, a CAESAR finalist for lightweight applications. On a software implementation of Ascon, simulations show that FIMA recovers the secret key with fewer than 50% of the fault injections required by previous techniques that rely on fault bias alone; furthermore, in the presence of error-detection and infective countermeasures, FIMA is \(6\times \) more efficient than previous bias-based techniques. 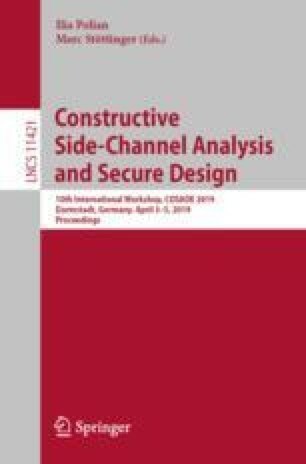 This work was supported by NIST award 70NANB18H219 for Lightweight Cryptography in Hardware and Embedded Systems.